I am still enjoying blueberries. I am hoping that they will just keep coming, but I know that they will be coming to an end soon. In the meantime it seems like I really can’t get enough of them. I have been having fun pairing the blueberries with all sorts of things this year. Normally I would stick to simple things like muffins or a simple blueberry coffee cake, but of late I have combining different flavors with my blueberries. 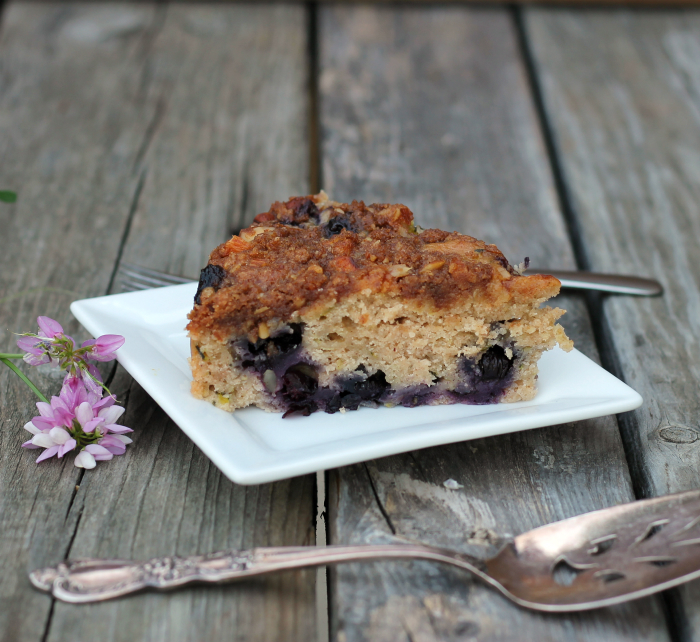 Like this blueberry zucchini coffee cake. Yes, it is that time of year for the zucchini to start coming out our ears. So when I was deciding on what recipes to make for the blog this week, I decided to use some zucchini with the blueberries. I never thought that it would turn out quite as delicious as it did. 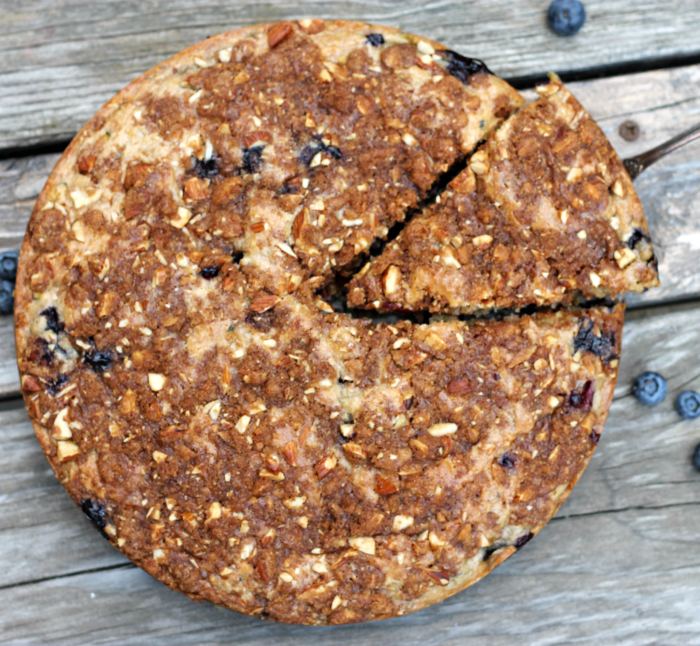 The zucchini certainly made this coffee cake super moist and the blueberries; well I just love the flavor of blueberries in any baked goodies. I couldn’t resist adding a little bit of sweet topping to this coffee cake. The topping is pretty simple, it consists of brown sugar, flour, cinnamon, butter, and some chopped pecan. I like to use this topping when I am making coffee cakes; it seems to go well with any type of coffee cake you are making. 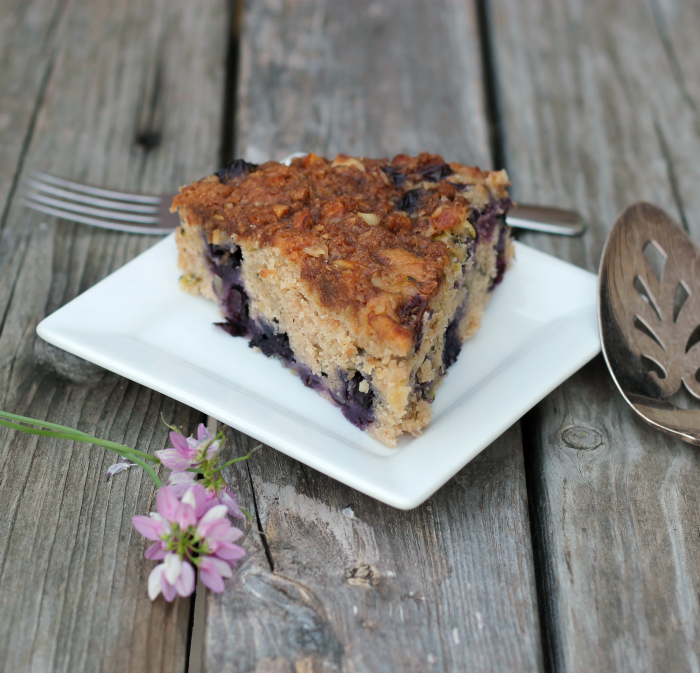 You really need to try this coffee cake before the blueberry season passes us by, it will be gone before you know it. Preheat oven to 350 degrees F. Grease a 9-inch spring-form pan. Sift together the flour, salt, baking powder, cinnamon, and sugar and set to the side. In another bowl mix together the egg, sour cream, and melted butter. Pour the egg mixture into the bowl with the dry ingredients and blend just until incorporated. Add the zucchini and blueberries and gently fold in. Spread in the prepared spring form pan. Prepare the topping. Mix all the dry ingredients together and add the melted butter. Mixed until all ingredients are combined. Sprinkle over top of the cake. Bake in the preheat 350 degree F oven for 55 to 60 minutes or until a wooden pick comes out clean. I love that there is zucchini in there. This is a must try. Love it. wow! I love coffee flavours in cakes and this looks so tempting! Hi Dawn, I love baking with zucchini too, love this coffee cake, especially the topping. I WISH I had zucchini coming out of my ears! For some reason, I rarely buy zucchini, but I always want to try the delicious recipes on the blogs I see! Your cake looks delicious! 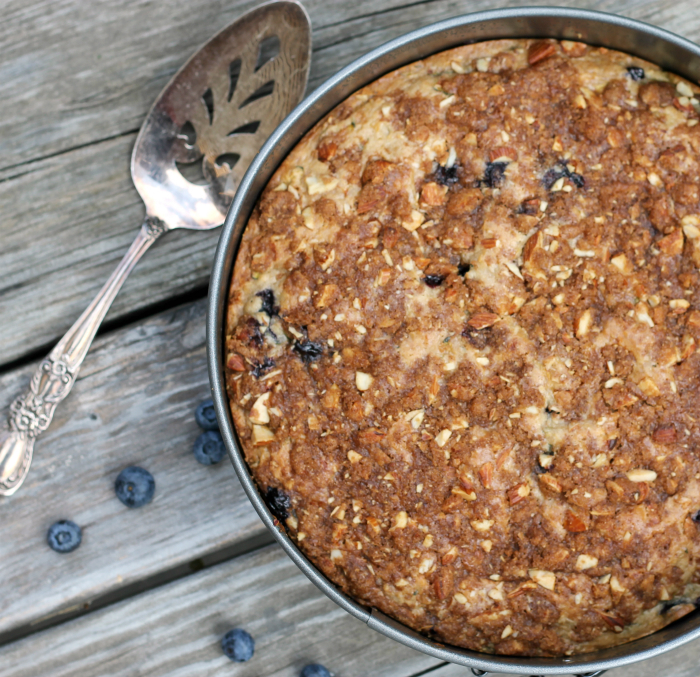 Love that you added blueberries to this zucchini cake! What a great combination! I can’t seem to get enough of blueberries this season. I just want to eat them ALL 🙂 Will have to try this… looks like the perfect snack (or maybe even breakfast!) Thanks for sharing! Please keep the blueberry recipes coming for as long as possible! I’m obsessed with them this year. What a fabulous coffee cake. The zucchini addition is such a fun twist! What a gorgeous coffee cake! The combination of zucchini and blueberries sounds terrific! I actually bought zucchini at the farmers’ market this weekend—nobody was sharing with me and I get so hungry seeing all these yummy summer squash recipes!!! 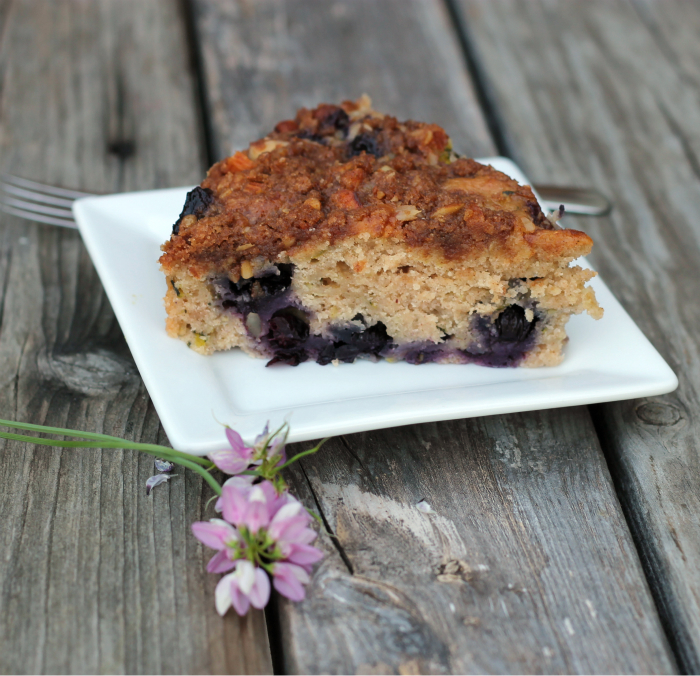 I love how you incorporated zucchini and blueberries into this cake! Great way to sneak in some fruits and veggies!